The new iPhone SE. It was Apple's big announcement, and an attempt to reinforce its phone business, which brings in between 60% and 70% of the company's revenues annually. But, most importantly with the 'special edition', it's hoping to not repeat the mistakes it made with its last 'budget' attempt, the iPhone 5C. The SE is smaller, lighter, and just as powerful as the bigger iPhones that launched in September last year. 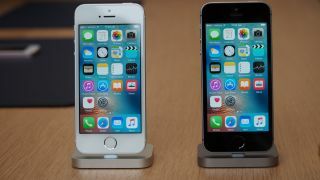 It has the same body (more or less) as the iPhone 5S, released in late 2013, with the same 4-inch Retina display. The camera is improved, however, and it contains an A9 processor, which is the same as that in the iPhone 6S. Despite the looks, the SE is the spiritual successor to the iPhone 5C. While the bodies are made of different materials – plastic on the 5C vs metal on the SE – they are aimed at roughly the same market: people with smaller hands or people who want an iPhone but are on a budget. These two markets are not mutually exclusive but do have two very different target audiences. Targeting the small-handed market is obvious – people with more cramped palms who find the 4.7-inch or 5.5-inch screens of the 6S and 6S Plus too big – but will likely not convert anyone to an iPhone who didn't already want one. The 5C was meant to address the low-end market directly by offering a cheap – by iPhone standards, at least – phone that ran iOS, had a decent camera, and an Apple logo on the back. However, the 5C was plastic – "unapologetically plastic" as Jony Ive, Apple's chief design officer, said on the promotional video – and that led to an impression that it was low quality, and did not match the status of the iPhone as the high-end destination phone. The SE, with its metal body and good looks, likely won't suffer from these issues despite being lower spec. We don't know the actual spec list yet, but most people don't care about the internals of a smartphone – 1GB of RAM looks much the same as 2GB if all the user does is surf Facebook and check email – and so the phone's design, how it feels in the hand and what it's made of become more important in inspiring a purchase. Samsung originally built its entire handset business on the back of plastic phones that cost more than $400, but the iPhone still holds the majority of the high-end phone market, and for many is synonymous with luxury, quality, and prestige, although that may be fading as its mass market appeal grows. Still, it's not a mistake that celebrities rush to use an iPhone – even when they say they are not going to. If the first glance, and then first touch, is what makes or breaks an iPhone then the 5C was always doomed to fail. Despite its fun guise – it came in 6 or 7 very distinct and vibrant colors – people wanted quality, and Apple has learnt a hard lesson. The SE won't suffer from any of these issues because it looks like a previous high-end iPhone – the 5S – and is as powerful as today's high-end model in every area that counts: camera, battery life (which is reportedly better than the 6S Plus), and its ability to play games, videos, and scroll Facebook, Instagram or Twitter. The phone costs $399 (£359 / AU$679) for the 16GB model, around $150 (£100 / AU$200) cheaper than the iPhone 6 and $250 (£175 / AU$330) cheaper than the iPhone 6S, and comes in four colors, all of which are the same as the high-end models. It's a sensible, cheap iPhone that works as well as its bigger brothers – and that is exactly the market Apple wants to address. Apple obviously believes the iPhone SE will be a commercial hit – and this time there are signs it will be. Unlike the 5C, the SE has a high-quality body that represents an older top-tier iPhone, the 5S, but with the internals of the newer models. Anyone who picks up the SE will immediately sense that it's essentially the iPhone 6S with a 4-inch display and slightly different body. Apple has previously touted that 30% of iPhone buyers are switching from Android – around 22.5 million sales in the three months leading up to January – and that is clearly the next growth market it's aiming for with the SE. Apple is not going to win in Asia (besides China, where higher levels of wealth has led to an iPhone boom) or South America, where consumers are highly price-sensitive, but it can capture the users who have been through the first stage of smartphone ownership with Android and have the wealth to at least consider an iPhone. The technology press may have let out a collective sigh of slight disappointment when the SE was unveiled – especially as it was, almost exactly, what had been leaked, and didn't bring reams of innovation –but it's not about that; it's about capturing more and more Android users who want to get their first iPhone. The SE looks to pick up where the 5C left off, but do almost everything differently. The phone is no longer an afterthought, trailing behind the high-end models; instead, it got its own launch event, and has its own set of unique characteristics, like powerful internals, that make it a high-end phone in its own right.